All renovations should focus on function first and foremost. How do you want to use the basement? If you’re turning it into an extra bedroom, you’ll have different considerations than if you’re creating a media room or office. The biggest threat to your basement renovation is moisture. Areas prone to moisture build-up can develop leaks and cracks, which can invite more moisture from the outdoors to seep indoors. Not only does this ruin the space, but it also puts your foundation in jeopardy. To be safe, get added insulation to keep the area free from moisture. More space makes more room for your furniture and belongings, while also helping the basement feel brighter. The last thing you want is a dark, cramped space. Check for any items that cut the room in half, or seem like unnecessary roadblocks. Once those are out of the way, you can move around without worries. The basement will need to be maintained and cleaned regularly. However, there are things you can do to make the space lower maintenance. The best kind of installations are those that reduce the need for cleaning. Consider adding flooring and bathroom items designed to make cleanup easier. 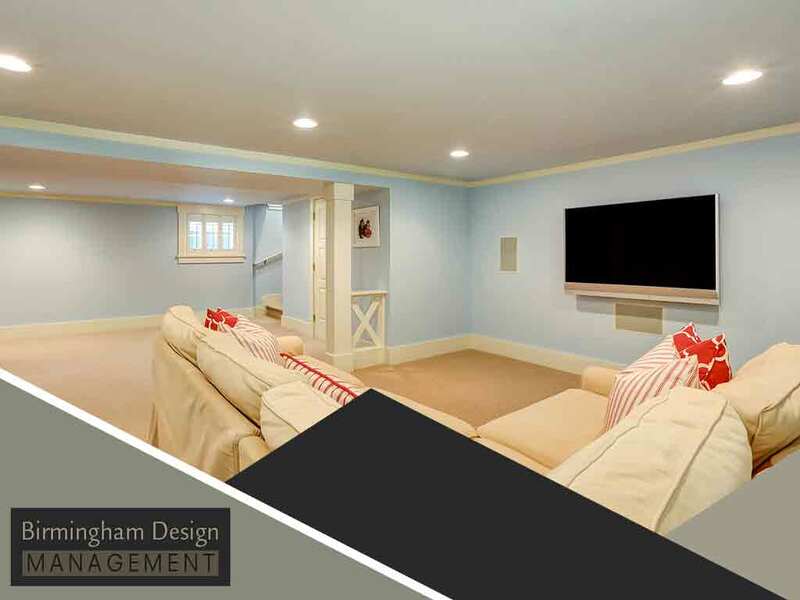 Birmingham Design Management has been in the business for over 22 years. We’ve helped many homeowners change their basements for the better. As a home improvement expert, we’ll make sure your vision is realized. We offer many services, including basement and bathroom remodeling. Want to learn more about us? Get a FREE estimate by calling us today at (410) 751-6439 or by completing our online contact form.